Whether you’re planning to fix enough Deviled Eggs to feed everyone at the company picnic, or you just want to host the biggest Easter Egg Hunt in the neighborhood this year, you can save time if you know how to make hard boiled eggs for a crowd. But first, you need to forget everything you know about making hard boiled eggs. You see, the secret is that you don’t boil them at all — you make them in your oven! Using an oven means you can make hard boiled eggs for a crowd all at once, without having to boil then chill and then boil and chill more. Oh, and since this method is perfectly timed you’ll never get that nasty gray ring around the yolk that comes from overcooking. That gray ring is so gross! Note: this post contains Amazon affiliate links for your shopping convenience. Using these links doesn’t increase your price, but it does generate a small commission which pays for the coffee that powers this blog. For more about the cleaning tools and supplies I use in my home, check out my Recommended Products Page. If you’re worried about messing up your oven, you can use a muffin pan to hold the eggs. Since I watch the timer, I’ve never had an egg explode so I don’t bother with the pan, I just place the eggs directly on my oven racks so they’re not touching. Step 1 Start with a cold oven then arrange the eggs on your oven racks, shut the door, and turn the temperature to 325°F. Immediately start a 30-minute timer. While the eggs cook, prepare an ice bath in the sink or a large bowl. Step 2 The eggs are very hot when they’re done, so if you don’t use the muffin pan you’ll want to remove them from the oven using tongs or silicone gloves then plunge them into ice water immediately they’re done to stop their cooking. If you have an Instant Pot (and I’m so crazy about mine that I think everyone should own one!) you’re in luck: this thing makes the best hard eggs and they peel SO EASILY! Step 1 All you need to do is add your eggs to the Instant Pot by arranging them on top of the trivet rack. Stack them up to the “max fill” line if you like — you can make anywhere from 1 to 3 dozen eggs, depending on your Instant Pot size. Add 1 1/2 cups of water, put on the lid, then set it manually to high pressure for 2 minutes. Step 2 Once the machine beeps, let it naturally release pressure for 15 minutes then carefully open the valve to make sure the pressure has fully dropped. Open the lid and transfer the eggs to an ice bath. They’re ready to peel in minutes, though with this method the peels practically slip off on their own! Make several dozen eggs at a time using this easy 2-step for the oven or the [url href=”http://amzn.to/2mWpRNI” target=”_blank” rel=”nofollow”]Instant Pot[/url]. 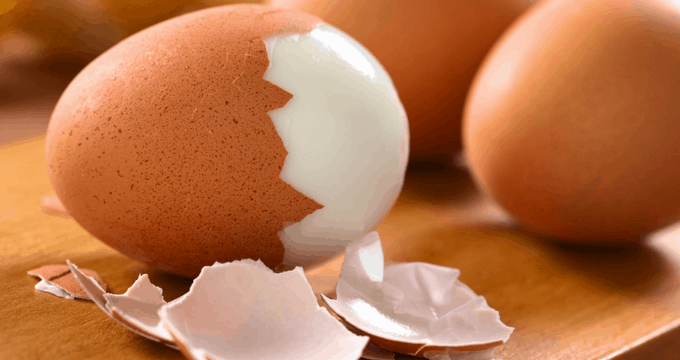 Once cool, these eggs practically peel themselves! Let the eggs cook for exactly 30 minutes then immediately transfer them to an ice bath. [b]Instant Pot Method[/b] Place trivet rack in Instant Pot. Add 1 1/2 cups water. Add eggs, put on the lid and make sure the valve is closed. Set manually to high pressure for 2 minutes. When machine beeps, wait 15 minutes then carefully open the valve to make sure pressure is fully released. Open the lid and immediately transfer eggs to ice bath. • Making these for an Easter Egg Hunt? Check out these how to naturally dye Easter Eggs using kitchen ingredients. 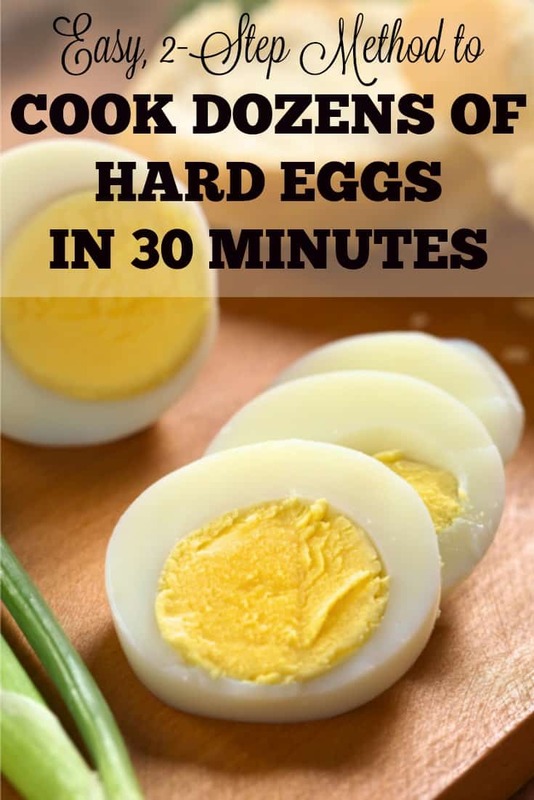 • Once the hunt is over, here are some great great recipes using hard boiled eggs. • Don’t toss the shells until you’ve checked out these awesome ways to use eggshells around the house! Note: This entry first appeared on Dec. 7, 2011. Should eggs be at room temperature before placing in oven? That may have been the problem for the lady with soft boiled eggs. I put mine in the oven straight from the refrigerator and haven’t had a problem. I really do think it’s possible her oven runs hot. I’m frustrated…. i just did exactly as you posted – with 3 dozen eggs that i was responsible for cooking to dye this evening with 4 children. I just opened one to test after cooling in ice bath –it is SOFT BOILED!!!!! Squishy yolk that I’m sure not one of the kids will eat (nor myself)! Please tell me there is a way to fix this…. I’m so sorry you had a problem! For an immediate solution, you could boil them for a couple of minutes. The bigger concern, though, is because there are literally dozens of posts and Pins from other blogs with these exact same instructions and dozens of “Tried it” successes. So I’d encourage you to get an oven thermometer to make sure it’s heating to the temperature you’ve set it for.